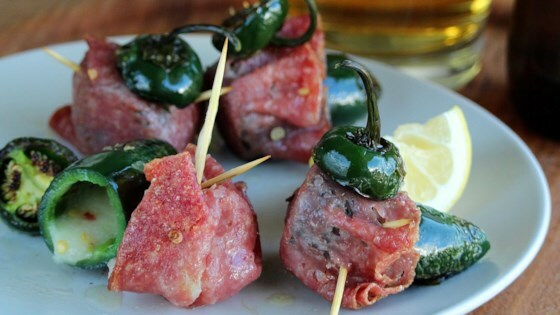 "Spicy appetizers made from stuffed jalapeno or habanero peppers. Believe it or not, if cooked thoroughly, and if you remove the seeds, a person can even eat a whole habanero fixed this way. You might hop around a bit, but you'll survive, and the capsaicin rush is incredible!" Slice off the stem ends of the jalapeno peppers, and carefully remove the seeds and white fibers with a small knife. Fill the pepper with cheese. Take one piece of salami, and cover the open end of the pepper with it. Fold it around, and secure with three toothpicks in a row (like the legs of an insect). The salami should keep the cheese from leaking out when grilling. Preheat on outdoor grill for high heat, and lightly oil the grate. Place the peppers legs side up on the hot grill. Turn occasionally after a minute or two as the meat begins to crisp up, and the skin on the peppers is starting to blister. When it is evenly browned the toothpicks will have turned black like six little legs sticking out - hence the name cucarachas. Allow the peppers to cool slightly, then remove toothpicks and enjoy! try cream cheese and wrapped with bacon. DEFINITELY A PARTY FAVE FROM NOW ON! These are INtense, but really fun. Of course, it turned into a "who can eat the most" contest!